Reading Time: 4 minutes Moving Motivators is a card game to reflect on people's motivation and how it is affected by organisational change. The cards help to unveil and discuss ten intrinsic desires, which motivates people most. It is a metaphorical game to reflect on people's motivation and how this is affected by organisational change. Moving Motivators is a facilitation format I use frequently. 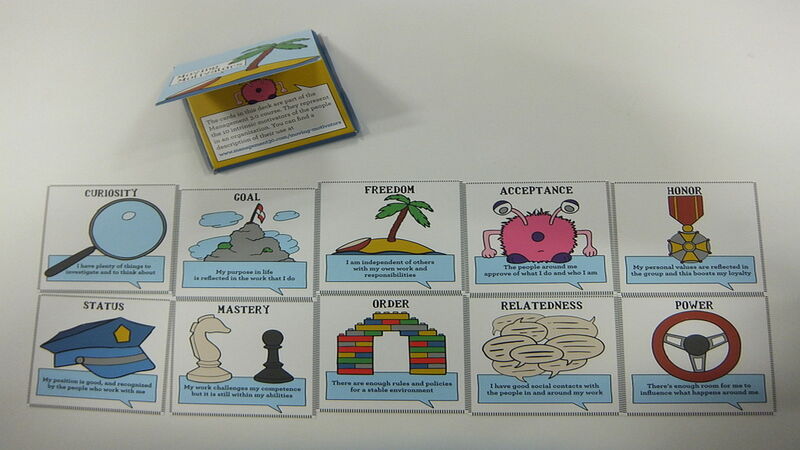 Moving Motivators use a card set as metaphors to reflect on people's motivation and how it is affected by organisational change. It is based on the model of ten intrinsic desires, which motivates us most. The method is a technique of Management 3.0. 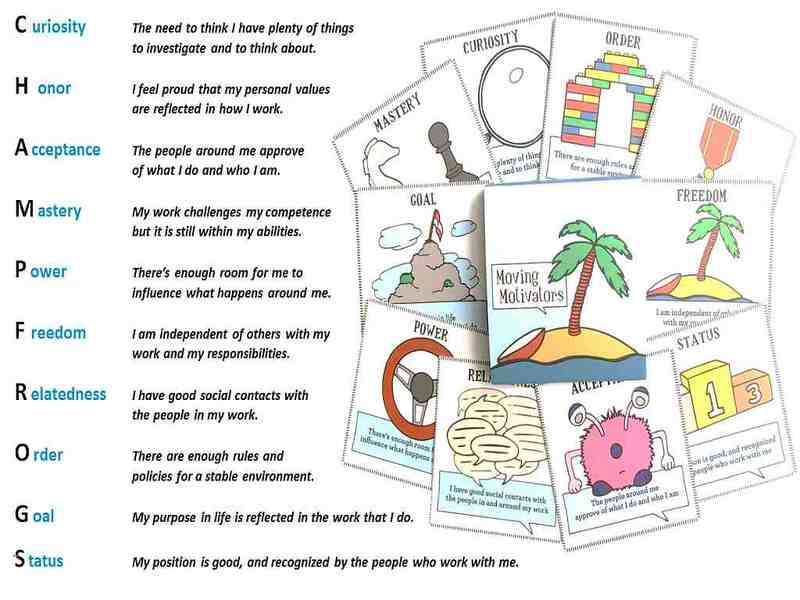 The Moving Motivators facilitation exercise is based on the Champfrogs model of the ten intrinsic desires, which motivates us most. Jurgen Appelo, Management 3.0 guru, developed the game and derived the model from the works of Daniel Pink, Steven Reiss, and Edward Deci/Richard Ryan. For sure, there a lot of psychological based theories of what motivates human best - all differing in slight details. The Champfrogs model is a best-of-breed approach out of all. The Moving Motivators facilitation reveals the effect of an (organisational) change on the people's motivators. When most of the important motivators go down, or when only the least important ones go up, you may realize that you have some work to do on your own motivation. For facilitation prepare one card set for each participant. The facilitator should ask the participants at the beginning to take notes of their own and of all other results. The facilitator asks the participants to determine which motivators are most important to them individually. The participants should answer this by ordering the cards from the left (least important) to the right (most important: 5 min) When the participants finish their ordering everyone explains to the others his/her ordering of the motivators (5 min). The facilitator asks the participants to consider a change in their work life, such as an Agile transformation, a relocation, a new project, or a new job. If the change is positive the participants are asked to move the card upwards, or if the change is negative then downwards. When the change had no effect on the motivator, the card should remain in the middle. (15 min) Allow each participant to explain their results to others to ensure high visibility (5 min). You will probably see that organisational changes have a different impact on different motivators. Perhaps the Agile transformation of your team makes your own Curiosity card go up, but your own Competence card may (temporarily) go down. Or the new job you applied for, will increase your own Status while at the same time it may decrease your own Relatedness.Depending on the complexity of the facilitation exposed, and the time frame given, the facilitator repeats step 2 often to analysis dependencies of changing a new motivator to all others motivators. The exercise may give better insights than a regular conversation. Find out what motivates team members, and how an organisational change is affecting them. Analysis of upper management (C-level) motivations (private one-on-one coaching). Conflict resolution: create a snapshot of actual team constellation (retrospective). Team motivator index: publish results continuously to show evolution. Prepares one card set for each participant. Takes care that all participants lay out the cards in the same horizontal direction. Helps the discussion stays focused on motivators. Moderates in case of conflict and disagreement. Helps the group to explore many sides of the issue. Shifts focus – moves from one speaker or topic to another. Helps group members grapple with the content by asking probing questions. Helps group members identify areas of agreement and disagreement. Creates opportunities for everyone to participate. Summarise key points in the discussion, or ask others to do so.